Goal: Setup a Routed Mode WanLink between two Virtual Routers. In this test scenario, LANforge-ICE is used to simulate a routed network where incoming traffic on one port is sent through one Virtual Router then through a WanLink, then through a second Virtual Router and then finally out to a port on a different network. 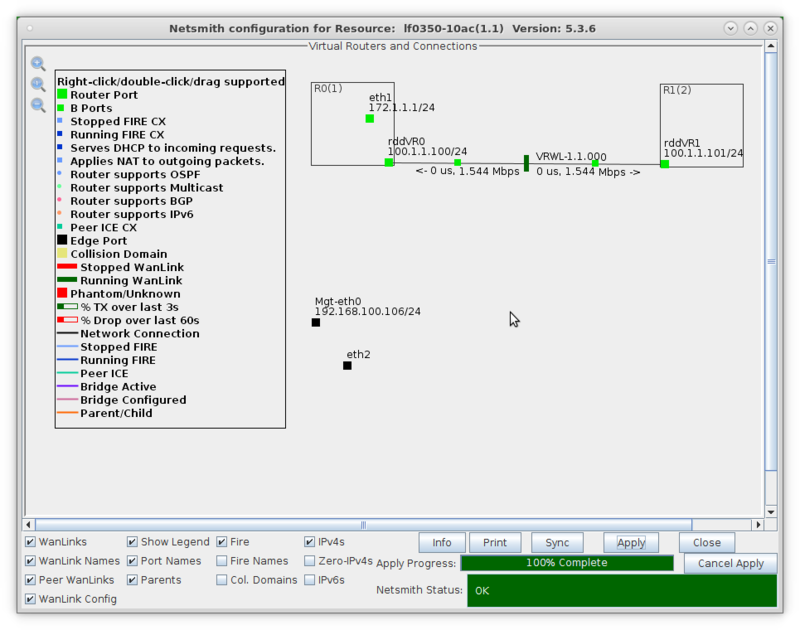 Accept defaults, or change the name, graphical size and notes about the Virtual Router. 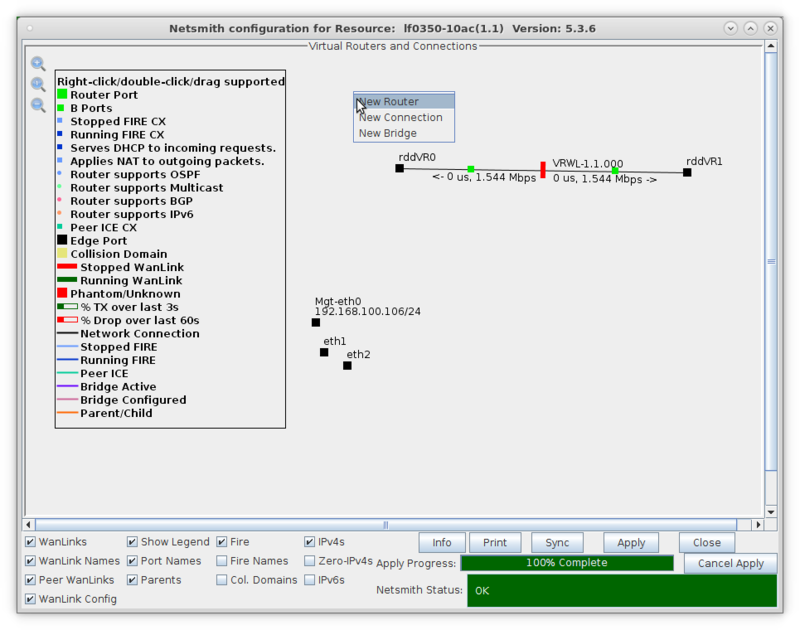 NOTE: After making any changes to the Netsmith window, you must click Apply or your changes will NOT be implemented and could be lost. 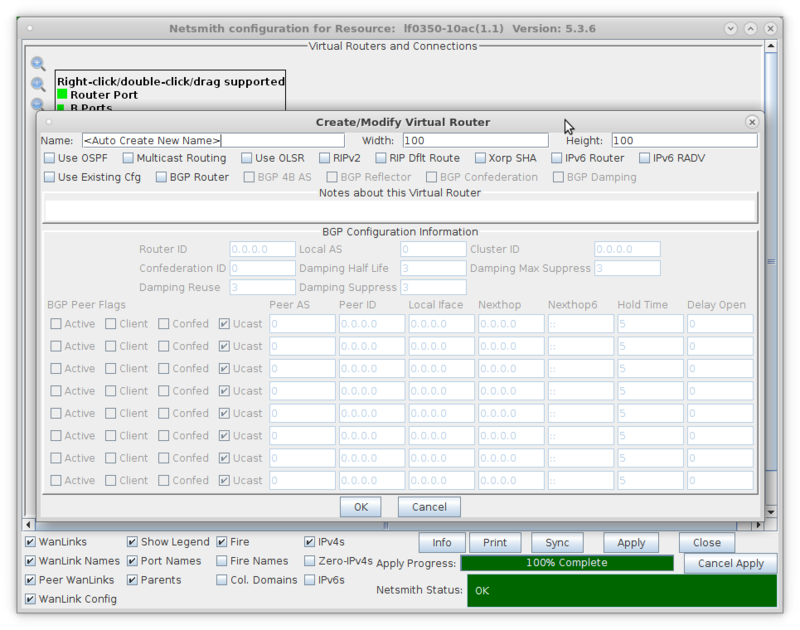 NOTE: Clicking Sync makes sure any changes are synchronized with the current database. 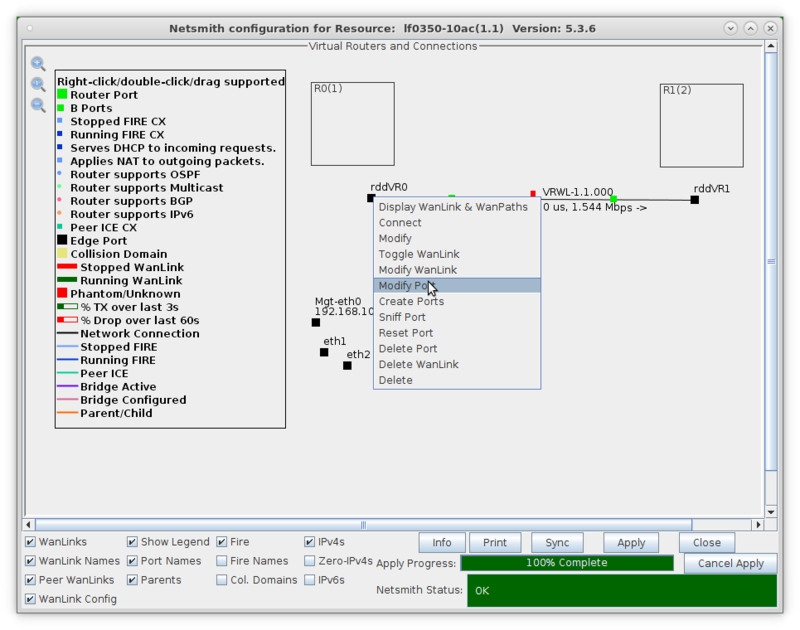 Also, note the Netsmith Apply Progress bar displayed at the bottom of the Netsmith window. 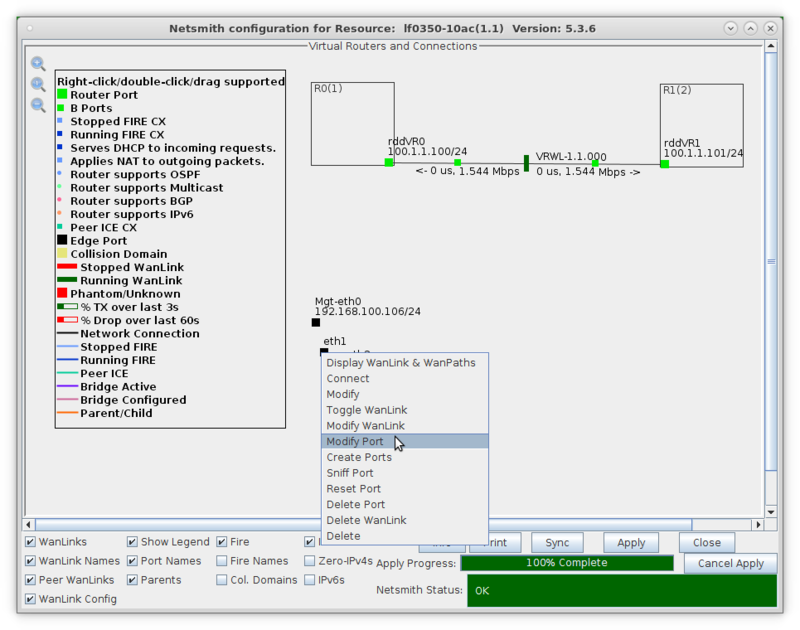 Configure the ports on the ends of the WanLink. 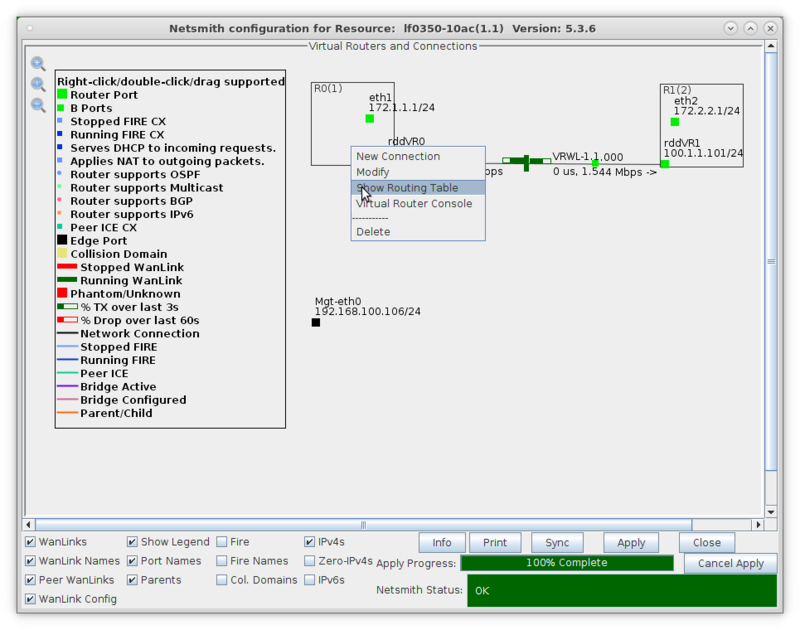 Assign an IP address and Network Mask. 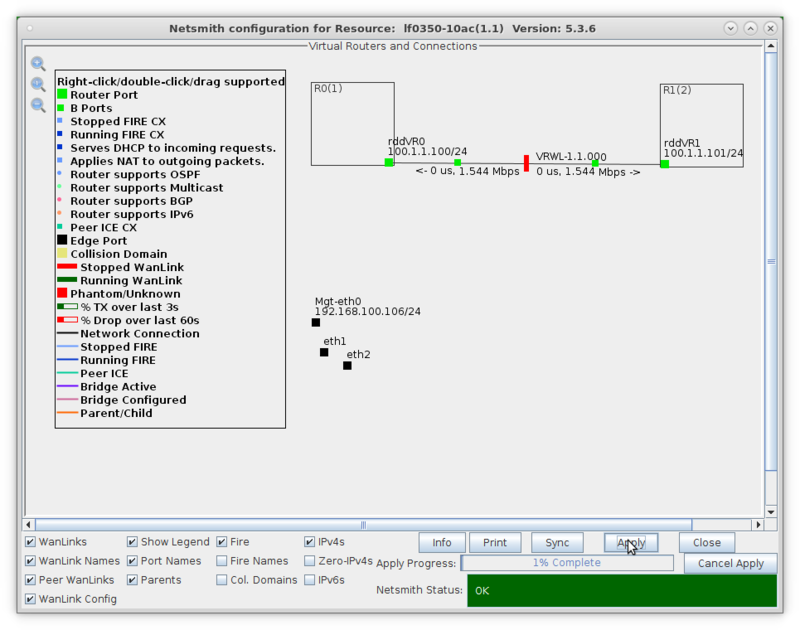 This example uses 10.1.1.100 and 255.255.255.0. 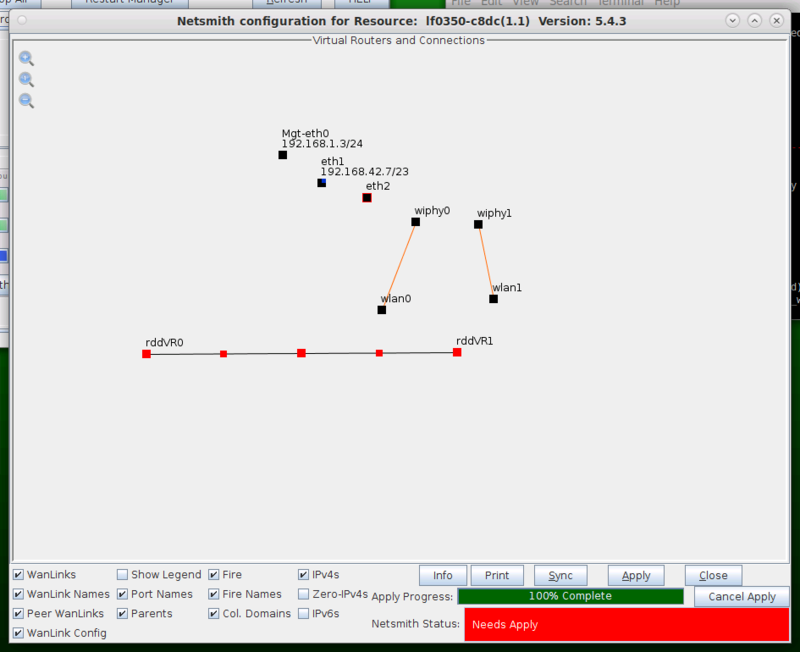 This example uses 10.1.1.101 and 255.255.255.0. 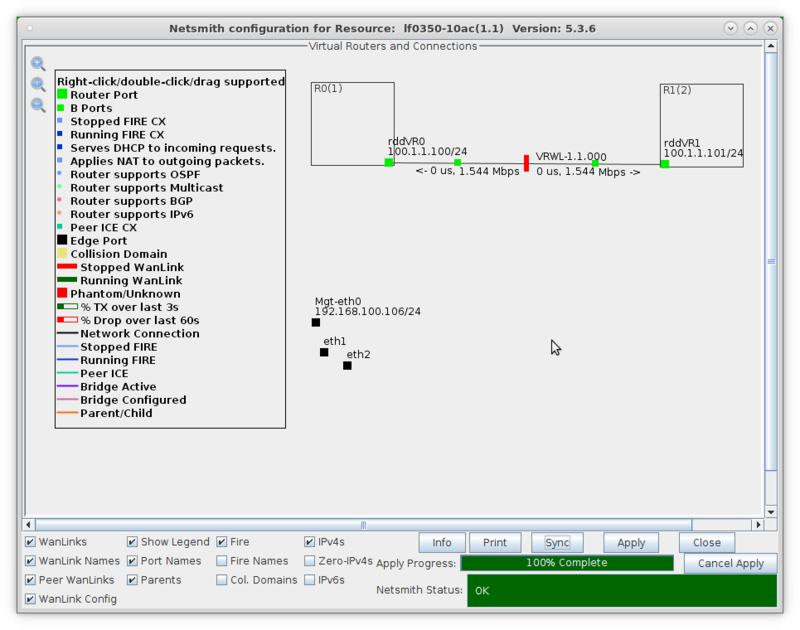 Drag the ends of the WanLink into the Virtual Routers. 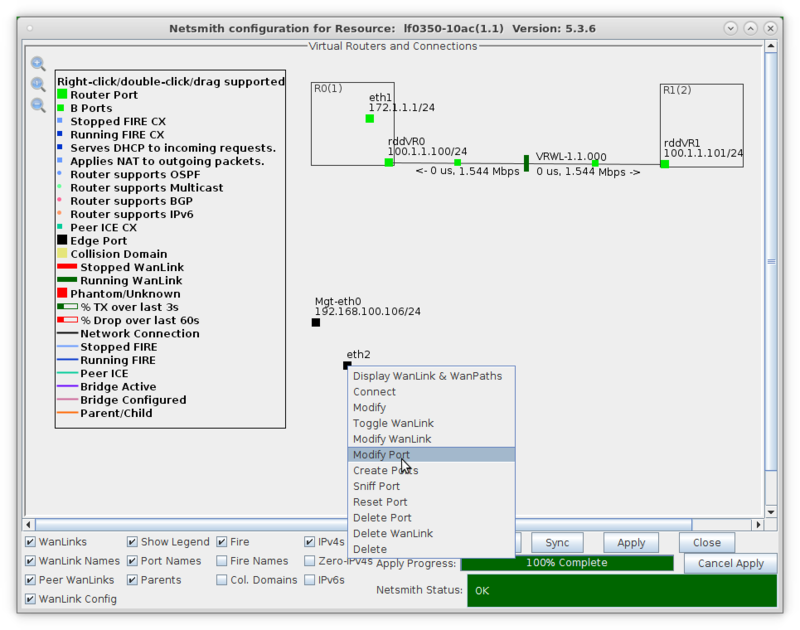 Setup the Routed Mode WanLink characteristics. Verify that the B-side ports, rddVR0b and rddVR1b are filled in. 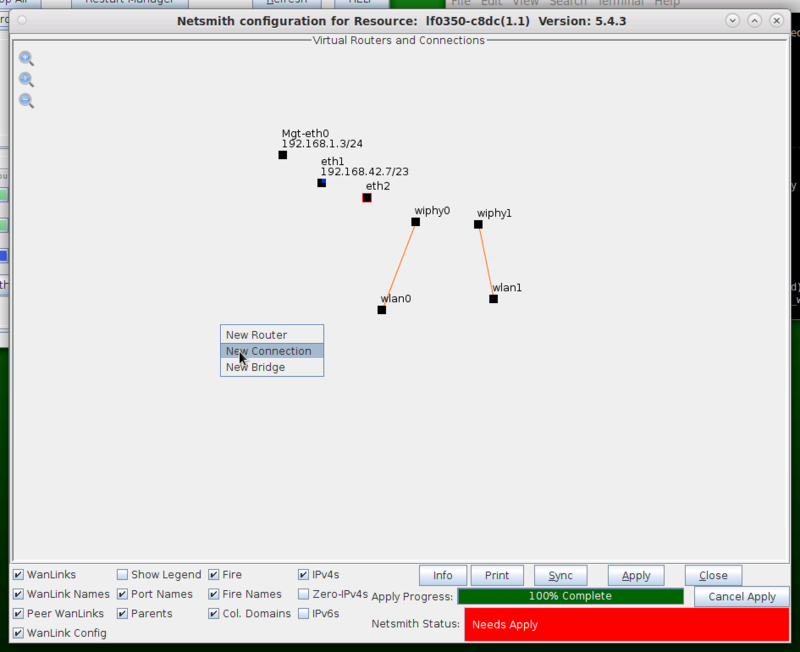 NOTE: Be sure to set the impairment, if any, and transfer rate. Right-click the WanLink and select Toggle Wanlink to set its status to Running (green). 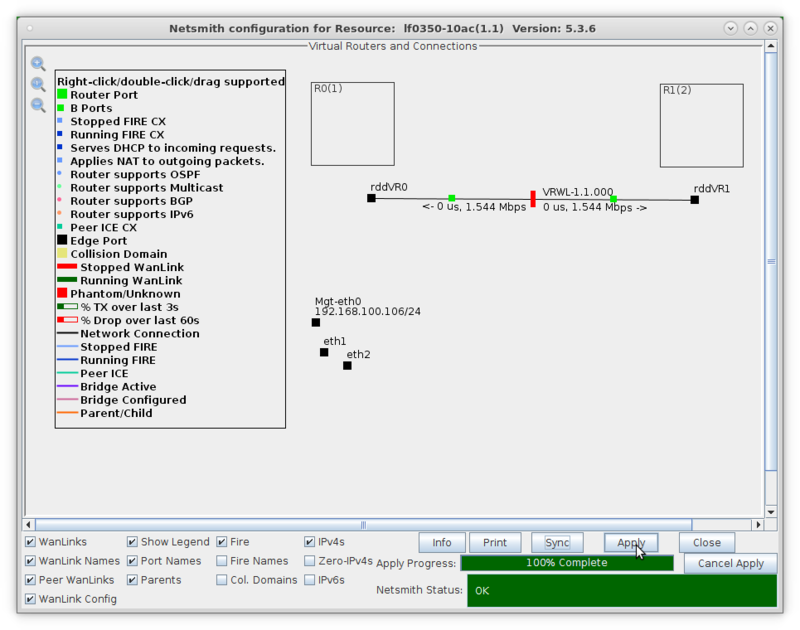 Assign port eth2 an IP address and Network Mask. 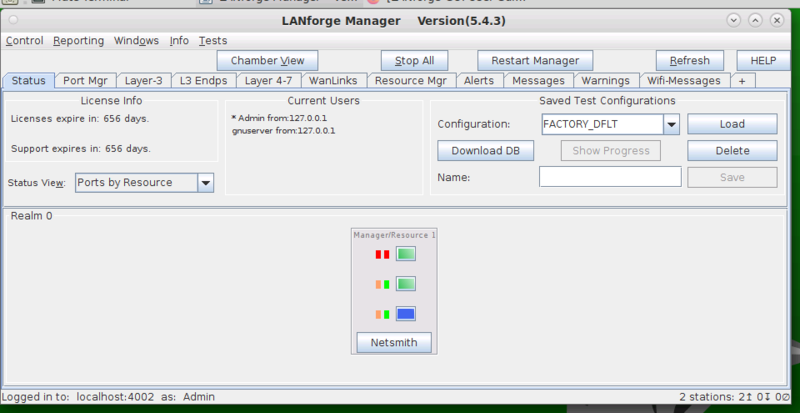 To generate routed network traffic refer to the LANforge FIRE Cookbook Routed Network Testing section. 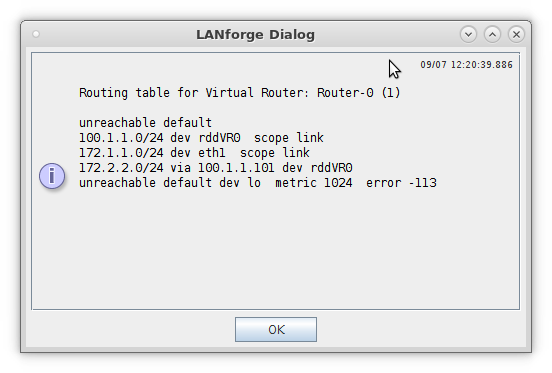 LANforge Virtual Routers by default use simple subnet routing, but can also use OSPF or BGP routing protocols. 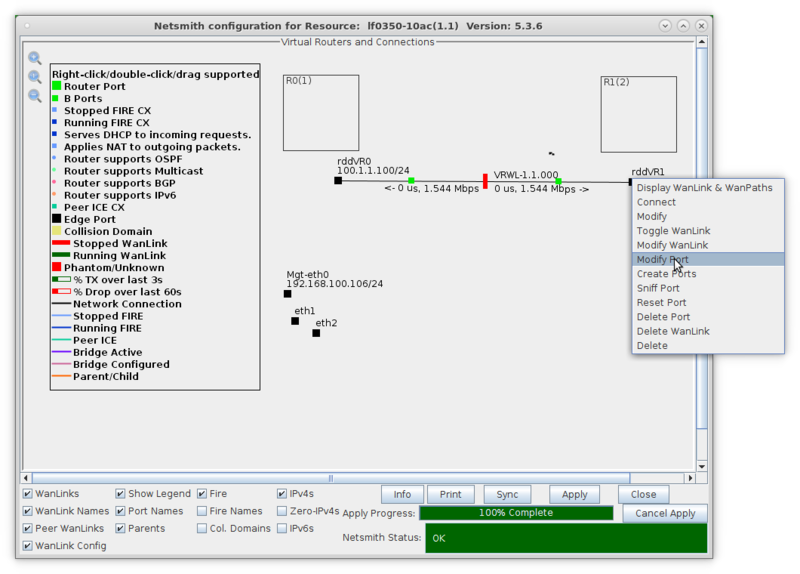 LANforge can also perform IPv4 multicast routing.